Tahiti Beach is a beautiful luxurious Island to live on. 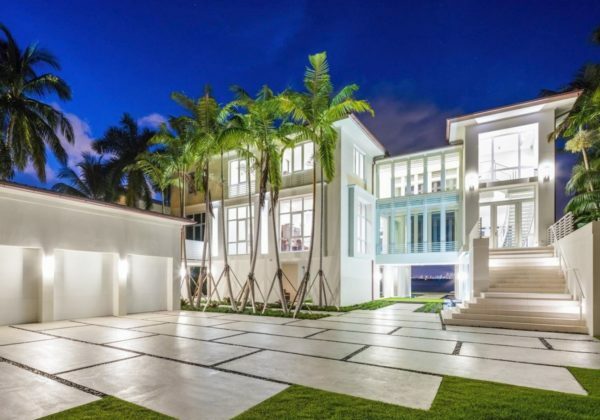 You will be part of paradise as soon as you enter this island.This home is located in one of the most exclusive gated communities.This immaculate contemporary waterfront home was built in 2017. Including 161 feet of the open bay. 5 bedrooms and 5.5 Bathrooms. Only 26 residences in this impeccable private neighborhood. Divine workmanship throughout with twelve-foot ceilings, floor-to-ceiling windows, elevator, light wood kitchen cabinetry, office with leather tile flooring, theatre room, garage currently holds three cars, with room to hold up to six if lift added. Zen-like Asian inspired partially covered pool & waterfall leading to a breezeway with unobstructed views of Biscayne Bay & Downtown Skyline all throughout the Estate.